Mitt Romney was gracious in defeat. His concession speech is here. A live stream of Barack Obama’s acceptance speech is here. Barack Obama, the post-partisan candidate of hope who became the first black U.S. president, won re-election today by overcoming four years of economic discontent with a mix of political populism and electoral math. Obama defeated Republican Mitt Romney, according to television network projections that show the president winning the electoral votes needed for re-election. . .
Huffington Post has an interactive map which currently shows Obama with 275 electoral votes and Romney with 203. Horripilation – the bristling of the body hair; a temporary local change in the skin when it becomes rougher due to erection of little muscles, as from cold, fear, or excitement; goose bumps. Justice Minister Judith Collins has made it clear she wants to get consensus on any change to MMP as a result of recommendations from the electoral Commission. The shameful ramming through of the Electoral Finance Act and its short life are a reminder of why any changes to electoral law should have more than a simple majority. Labour obviously doesn’t care about that. “Labour’s bill will deal with the most important recommendations made by the Commission. It will abolish the one electorate seat threshold for the allocation of list seats and lower the party vote threshold from 5% to 4%. It will also require the Electoral Commission to conduct a review after three general elections. “This should not be a party-political issue. I will be writing to the Prime Minister offering to work with the Government to see these changes put in place. It’s more than a little rich to talk about it not being a party-political issue when he’s writing off the government’s attempt to find common ground before it’s been given a chance. Fonterra’s director of research, science and technology has been elected president of the International Dairy Federation. Dr Jeremy Hill, who replaces Richard Doyle, was elected yesterday at the IDF’s World Dairy Summit in South Africa. The IDF bills itself as a “non-profit private sector organisation representing the interests of various stakeholders in dairying at the international level”. . .
Otago Daily Times agri-business editor Sally Rae and illustrations editor Stephen Jaquiery teamed up to add a book to the already groaning New Zealand bookseller’s shelves. This is their story of how that happened. One a writer, the other a photographer, and between us we have been on more than half of the 20 cavalcades, so co-producing a book on the Otago Goldfields Heritage Trust’s horse and cart pilgrimages seemed to make sense. We had an idea, a vision, a collection of many thousands of photographs and loads of potential subjects for compelling, highly entertaining stories. But before getting too serious, we had to find a publisher. . .
Lorraine Johnson is ready to counter any excuses people may have for not entering the 2013 Otago regional competition of the New Zealand Dairy Industry Awards. The awards will be launched at a function at the Cross Recreation Centre in Balclutha tomorrow at 7.30pm. Mrs Johnson, who is regional convener, urged people to “come along and launch yourself and your career”. . .
A decision to pipe the Ashburton Lyndhurst Irrigation scheme will result in significant energy savings and improved water use efficiency. The 234 shareholders in the Ashburton Lyndhurst Irrigation Limited (ALIL) have voted 82% in favour of piping over 200km of the scheme’s open water races. ALIL’s chairman, John van Polanen, says the energy saved by piping the scheme is equivalent to the energy used by 2000 homes. . .
I’ve blogged before about sky farms, and how I think they’re a truly excellent idea. When last I wrote about it in 2009, it was a mad (yet extremely rational), science fictional solution to agriculture. Now, as with so much of its ilk, it’s HERE. Singapore has built the world’s first sky farm: it opened this year. And now, it’s begun selling its produce. . .
Two international wine meetings are being held in Auckland this week – the Asia-Pacific Economic Cooperation (APEC) Wine Regulatory Forum (November 5-6) and the World Wine Trade Group meeting (November 7-9). The two-day APEC Wine Regulatory Forum will bring together 67 wine regulators and industry representatives from 15 APEC economies to discuss wine trade risk assessment and management as well as coordinating approaches to wine certification. Participants will also develop a set of recommendations for future APEC activities aimed at tackling unnecessary wine-related non-tariff barriers in the region. . .
My phone is due for an upgrade. The options came down to a Samsung Galaxy or an iPhone. The Galaxy was slightly smaller and was highly recommended but the iPhone has better service outside main centres which is important for me. Is opting for the iPhone the right decision or is there another model which is better than both of these? 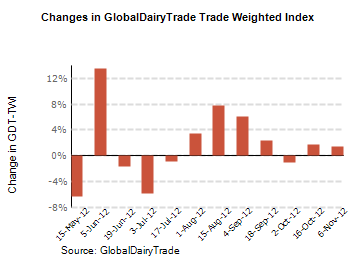 The trade weighted price increased 1.1% in this morning’s GlobalDairyTrade auction. That adds to a welcome trend above the long term average price. The price of anhydrous milk fat lifted 5.3%; butter milk increased 7.3; cheddar was up 2.5%; lactose was up 1.%; milk protein concentrate increased .5%; rennet casein was up 9%; skim milk powder increased 3.9% and the only drop was whole milk powder which was down 2.5%. You are currently browsing the Homepaddock blog archives for the day Wednesday, November 7th, 2012.